9 places for Seattleites to check out at the market when the sky is dark and the lines are short. It’s bone-chilling cold, dark way too early, and rainy for weeks, but guess what? 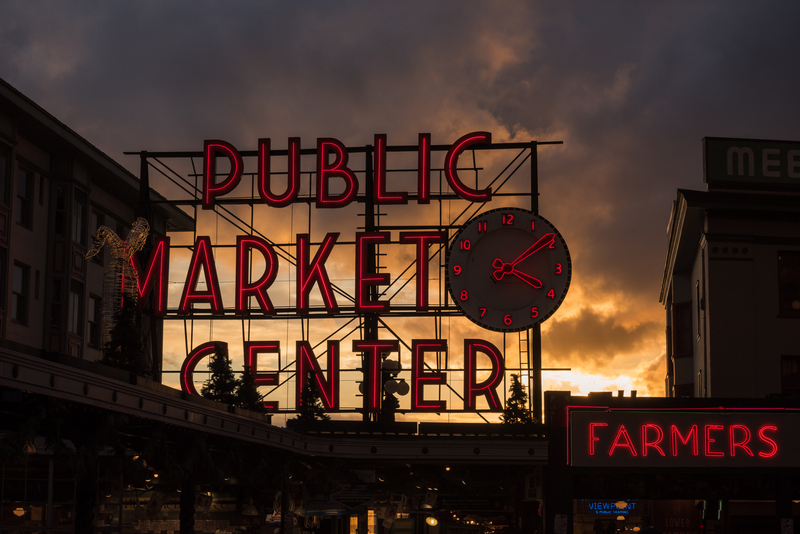 Winter is the absolute best time for locals to visit Pike Place Market. No tourists, no lines! Here are a few of my favorite places -- new and old -- at this iconic landmark that we’re so fortunate to have right in the middle of our city. Please, go! Like, now!! Cafe Campagne recently got a refresh, now the cozy dining room can peek into the open kitchen and watch chef Daisley Gordon and his crew turn out French classics like cassoulet, bouillbaisse and steak-frites. There’s also a tasty new meat-free option worth trying: Assiette de salades features a vegetable salad on marinated lentils. Big bonus: The new bread oven in the kitchen is now turning out some beautiful croissants and buns daily. Can we all agree, it’s a whole lot more fun to eat food on a stick? Get a naturally fermented, good-for-your-gut sour pickle on a stick at Britt’s, for the perfect $3 walking around snack. Guaruntee you’ll get some “where’d you get that?” queries out on the cobblestone streets. Tell ‘em it’s just down the hall from the magical Creamery, across from sweet Shy Giant Frozen Yogurt and kitty corner from the loveable Oriental Mart, home of some amazing Filipino home cooking. Andrew from Britt's shares a sour pickle. Did you know Seattle’s oldest wine shop has a club? I didn’t either until just a few weeks ago when a friend clued me in. It’s $40 a month for three bottles selected by the sharp staff at Pike & Western, and that also includes 15 percent off the rest of your purchases at this snug space that’s filled with all sorts of great options you’re not going to find elsewhere. Honest Biscuits is rightly famous for its signature sandwiches, but I’m a huge fan of the grits, which you can and most certainly should order on the side. Or, assemble your own winning break-y by asking for a fried egg on top, with some kale salad on the side. This humble take-away venue is located in the awesome new MarketFront addition. What? You haven’t been to the new MarketFront? Make tracks, already! Also in MarketFront, indi chocolates not only sells its bean-to-bar products, but serves espresso drinks and some really wonderful hot sipping chocolate. If the timing’s right, you might even catch the crew turning those thoughtfully sourced cacao beans into the dark chocolate that this business has gained acclaim for producing. Bavarian Meats not only has one of the most interesting deli counters in the city, it’s become a destination for sausage lovers looking for their lunchtime link fix. The new Jalapeno Popper Bratwurst will warm you right up down to your wool socks, with those fiery peppers, cream cheese and caramelized onions tucked inside the casing, turning this German classic into something that once you try it, you’re going to go to bed thinking about and wake up craving. Yes, it’s that good. Oh, also! They’re now selling the whiskey cured bacon that blew judges away at last year’s Bacon and Beer Classic (which is coming right up… save the date: April 28 at Safeco Field). Nothing brand new at The Crumpet Shop. Well, except that Rob Schneider and Adam Sandler were in recently, getting their maple butter crumpets on. (Really!) Very cool, guys, but I’m still a sucker for the marmalade partnered with Stilton cheese. Everything’s organic here and there’s free refills on hot tea. Kastoori Grill does a decent lunch buffet that almost always includes a very good goat curry, but you’re definitely gonna wanna save room for the soft serve mango ice cream. This brain-freeze-inducing, orange-y swirl is the real reason I frequent this spot. Mercato Stellina opened late last year and has been kinda flying under the radar. Which means you can still snag a table at lunch or dinner. And when you get settled in, do not miss Joe Obaya’s exceptional handmade pasta. Standouts include tender Dungeness crab gnocchi, tagliatelle Bolognese and Draper Valley chicken tortellini in a prosciutto-parm brodo. Great cocktails and stellar pizza, too. And that’s just a start. There’s so much more to explore. See you there?